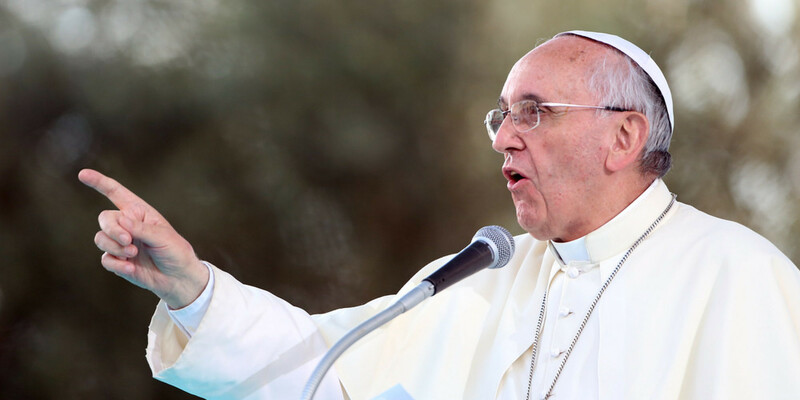 The Pope’s statements in Turkey shocked Syrian refugees. Indeed, the head of the Catholic Church thanked Ankara for its assistance without referring to the context. The flight of the Syrian population was in fact caused by the military support provided to the jihadists, including by Turkey. In addition, the situation of refugees may turn to disaster after international food assistance as halted on 1 December. The UN thereby intends to punish the refugees, who, since the Syrian presidential election in June, have proven that far from being opposed to the Syrian Arab Republic they are overwhelmingly in favor. “Today it is said that many things can not be done because there is no money. And yet, the money for weapons can be found, the money to make war“: this statement of Pope Francis has been ignored by Italian and Western government circles who conceal the fact that global military spending (approximately 1 750 billion dollars annually according to SIPRI) is driven by the US and NATO (more than 1000 billion dollars annually, to which must be added other expenses of a military nature). However, what Rome and other Western capitals gave special prominence to was the fact that, on arriving in Ankara, the Pope expressed his appreciation for “Turkey’s role in the Middle East region, by underlining in particular its humanitarian commitment for the reception of refugees fleeing conflict zones” . The pope took a similar stance in Amman, when he thanked the Jordanian kingdom for the “generous welcome given to refugees from Iraq and other crisis areas, especially neighboring Syria, mired in conflict for too long“, and urged Jordan to “continue to engage in the search for the desired peace for the whole region” . Such statements (most likely prompted by diplomatic considerations) which sing the praises of the role played by Turkey and Jordan in the Middle East region and their commitment to refugees, serve as a useful tool in the campaign conducted by Western governments and the media to befog reality. It is no coincidence that President Giorgio Napolitano, in his message on the eve of Pope Francis’ departure to Turkey, highlighted “the crucial role that Ankara is called upon to play in a region torn by strong tensions and bloody conflicts“. Turkey and Jordan are, in fact, the outposts of the military operations conducted by the USA and NATO, whose real goal is not to do away with the Islamic State – which serves their agenda – but to destroy the Syrian state (after Yugoslavia and Libya), to reconquer Iraq (possibly by dismembering it so as to better control it) and ultimately to attack Iran. According to investigations carried out by the New York Times and the Guardian, the CIA has set up in Turkey and Jordan various military centers for the training of Islamic groups (previously classified as terrorist by Washington) from Afghanistan, Libya and other countries, to be infiltrated in Syria; including groups that founded the EI in Syria, before launching the offensive against Iraq. The weapons are mainly channeled through Saudi Arabia and Qatar. 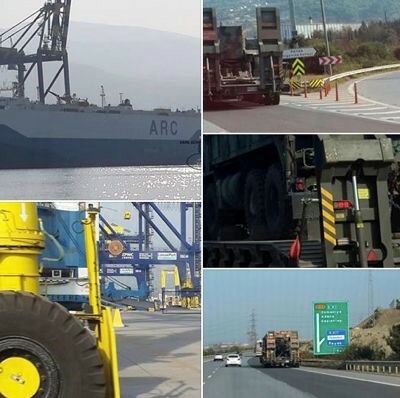 Turkey – where NATO has over twenty air, naval and electronic surveillance bases – currently hosts LANDCOM, the central command of the land forces of NATO’s 28 member counties, thus also including the Turkish forces; it was set up in Smyrna, from where he directs operations in Syria and Iraq. In Jordan – according to Associated Press  – the CIA runs a two-year training program for the rebel forces supported by the US that operate in conjunction with the Al Qaeda branch in Syria. Leading to additional waves of refugees who will benefit from the “generous welcome” of Turkey and Jordan. Manlio Dinucci is a geographer and geopolitical scientist. His latest books are Laboratorio di geografia, Zanichelli 2014 ; Geocommunity Ed. Zanichelli 2013 ; Escalation. Anatomia della guerra infinita, Ed. DeriveApprodi 2005. “Alla ricerca di una pace durevole“, L’Osservatore Romano, 24 May 2014. “Rebels push forward in southern Syria”, by Bassem Mroue, Associated Press, 28 November 2014. 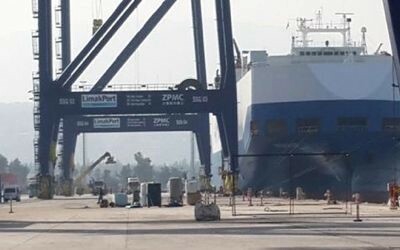 Turkish MP Dr. Mehmet Ali Ediboğlu] (Republican People’s Party – CHP) revealed that on 19 November 2014, a US ship had entered the port of Iskanderun carrying an illegal cargo of heavy weapons. The Erdoğan government is actively supporting the armed groups in Syria without distinction, including the Islamic State. 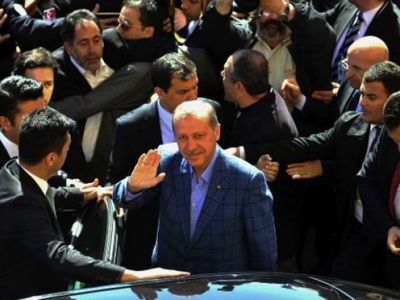 In this connection, the Turkish judicial authorities established that Erdoğan had secretly received Al-Qaeda’s banker at least a dozen times since the beginning of the war against Syria . Since mid-October, the CHP accuses him of secretly supporting the Islamic Emirate . “Israeli general says al Qaeda’s Syria fighters set up in Turkey”, Dan Williams, Reuters, 29 January 2014. “Erdoğan received Al-Qaeda’s banker in secret”, Translation Alizée Ville, Voltaire Network, 6 January 2014. “Kılıçdaroğlu accuses Erdoğan of actively supporting Islamic State”, Voltaire Network, 15 October 2014. AND A FURTHER SIDE NOTE REGARDING SYRIA…. A delegation of Christian leaders from Eastern Europe and the Middle East has visited the White House asking Obama to help support the survival of ancient Christian communities in the Mideast. They have urged him to reverse the Zio-dictated course of trying to destroy the government of the last great friend of Christians in the Mideast, President Assad of Syria. An article in the Mint Press telling of Obama’s admission to the Christian leaders . 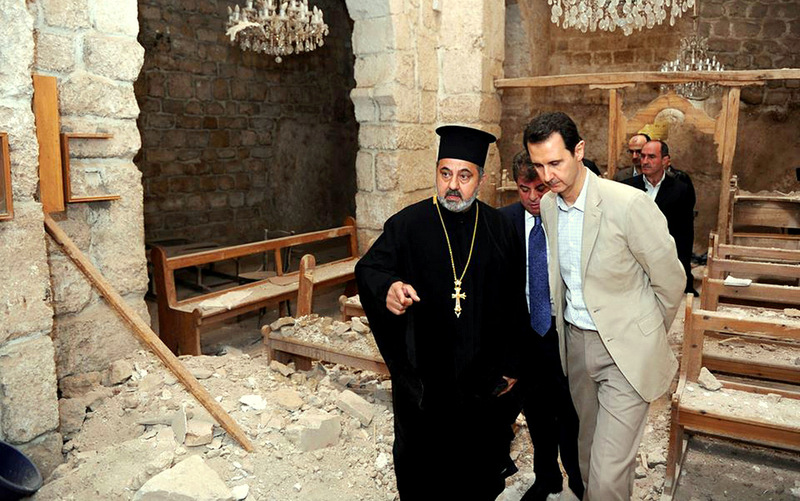 . . pictured, Syrian president Basher Assad visiting a Christian church, destroyed by Obama-backed “rebels” in Syria. Obama essentially admitted that he and the Zio-controlled U.S. Government has been long supporting terrorists who are the worst enemies of Christians and moderate Muslims in Syria, and that he has been supporting the destruction of the leader who is the only person who is preventing a slaughter of untold numbers of Christians and moderate Muslims. Of course, as I have been pointing in the last three years, it was clear from the start that the so-called “rebels” were dominated by Muslim extremists who the U.S. Government itself has branded as the most dangerous enemy of America: al Qaeda. Al-Nursra which was the dominant early power in the terrorism against Syria, was itself repeatedly identified as an al-Qaeda offshoot. On the other hand, President Assad and the Syrian Government has protected the Christians and the vast majority of Muslims in Syria who also see the threat of radical Wahabbism coming out of Saudi Arabia. He has fought against the al Qaeda elements who have from the very beginning been the antagonists behind the so-called “civil war” in Syria. In fact, that “civil war” is, and has been from the beginning, nothing more than an invasion carried out by the most murderous and extreme Muslim elements imaginable. The truth is that President Assad and the majority of Muslims support the Syrian Government, as exemplified by the top Muslim spiritual leader, the Grand Mufti. So, why has Obama and the American Congress supported policies that have directly led to the rise of ISIS? There is only one answer to that. It is extraordinarily simple. Israel views the governments of Syria, Lebanon and Iran as its worst enemies. 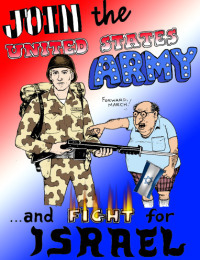 Israel wants civil war and mayhem in Syria, just as the Zionist state encouraged the civil war in Lebanon. America and other western European states are overwhelmingly Christian nations. At the same time, we have been told that al Qaeda and radical Muslim groups are the worst enemies to Europeans and to mankind. So why then, have our governments, by their actions, betrayed Christians and moderate Muslims? Why have our governments opposed Syria, certainly one of the most advanced secular states in the entire Middle East? Why have our governments promoted the conflict in Syria? The openly-stated world-wide Zionist policy is that they seek to destroy their strategic enemies and the any friends of the Palestinian people through a divide and conquer strategy. 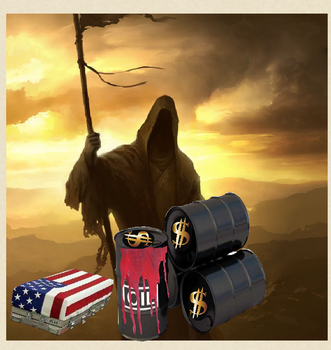 The reason why our governments have gone against every true interest of the American and European people—and the moderate Muslims and Christians of Syria—is simply because Obama and the American Congress is the grip of Zionist traitors to the people of the United States—and to the true interests of human rights in the Middle East and around the world. Why else would overwhelmingly Christian nations support the radical Muslim movements in Syria? Why else would overwhelmingly Christian nations try to destroy the legitimate government of Syria? Especially when that government is the only thing which stands in the way of a genocide of Christians in Syria? 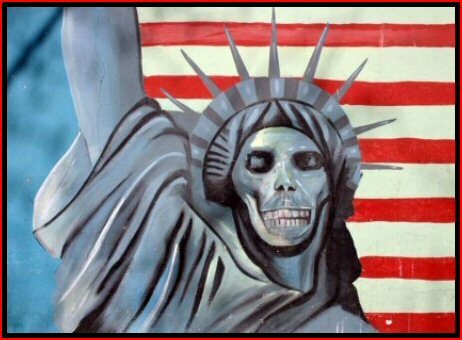 The Zio-controlled Congress of the United States has expressed its horror over the rise of ISIS terrorism in Syria and Iraq. Yet it is the same policies pursued by Obama over the last 6 years that have led to the rise anti-Christian and Muslim extremist terrorism in Syria and Iraq. Firstly I would like to reiterate in response to some of our American readers who have sent emails complaining about our “anti-American stance” in the past in some of the articles we present. I simply cite that much of the information we provide regarding the imbecilic foreign policies that the USA has adopted and implemented within various parts of the world, (and we take exception to the fact that US congressmen keep the American public in the dark about these very policies), are neither in America’s national interests nor conducive to world peace or trade. And more specifically, has done more damage towards Christians in any given part of the world, and which many American Christians and civil libertarians are virtually if not completely ignorant about. And it is here that I would emphasise to all our readers, particularly American and Western European, that the links between America, Saudi Arabia, the Gulf Arab states, Turkey and even Israel with known jihadist groups is not a new phenomenon. They are the same groups who triggered off the Bosnian and Kosovo conflict which precipitated the subsequent genocides by all sides, they are the same groups which held Afghanistan hostage for decades of war and brought Pakistan into the extremist Islamist realm, they are the same groups that produced the conflicts in Sudan and Somalia, and now they are the same groups which have embroiled Egypt, Libya, Algeria, Tunisia, Syria and Iraq. The support of the above mentioned countries towards the jihadist scum are responsible first and foremost for the bloodbath in Iraq and Syria. Furthermore the attempts to cover up their support for jihadists is one of the world’s worst kept secrets (much like efforts in the Ukraine also). 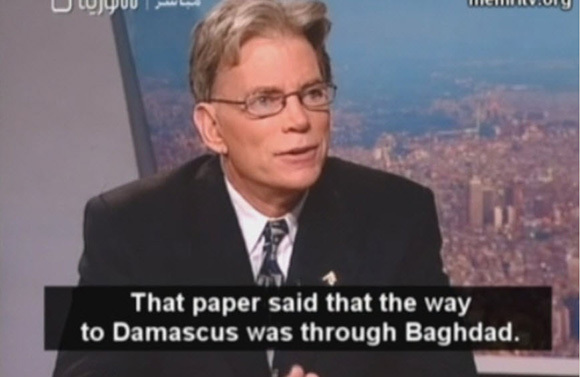 Photographic evidence, archival evidence, eyewitness accounts as well as national security reports by non-involved governments cite quite clearly the link between this bizarre alliance of America, certain Western European nations, Israel, Turkey, Saudi Arabia and the Arab Gulf states with death cult jihadist groups such as ISIS, Al-Nusra, Al-Qaeda and the myriad of parasitical scum that exists hiding behind the banner of Islam, Quran and the Sunna. And I would suggest that our Muslim readers, if they are truly serious Muslims of faith take note that these jihadist groups have one purpose only, which is to destroy and weaken Muslim nations and discredit Islam. The real threat to Islam is the existence of these groups within the world and specifically within the Islamic Ummah. Again I will repeat my message specifically to Israeli and diasporan Jews, whose myriad of institutions, lobby groups and the Israeli authorities are doing things which are not in their own personal or strategic interests by supporting jihadist groups in places like Iraq, Syria, Libya and elsewhere. As a side note, I would like to remind our Jewish readers that Hamas was a group formed and sponsored by the Israeli state against Arafat’s Fatah political and resistance party….Needless to say the results speak openly with the current troubles in Gaza for both Israelis and Palestinians. (-And I note the irony, having lived in the Middle East myself and maintaining links with the region, of how Jews and Arabs are able to live in complete peace and harmony within the same residential complex or street in Tel Aviv or Damascus than in the occupied West Bank…I would suggest instead of Israel trying to create micro-conflicts within the region and posing a threat to itself in order to shift Israeli Jewish attention from domestic policies, to instead integrate the Palestinians into the Israeli state as citizens, who can access the same services and opportunities, own land outright and participate within national political life at all levels, thus ending the constant conflict that has plagued the region for over 60 years and counting, while establish firmly once and for all clear borders without the need for an unworkable two-state solution). This of course brings me finally to highlight the bizarre role of Pope Francis who has initiated his own “Mid-East Peace plan” where he supposedly is supporting peace but is congratulating and backing up the very nations who are responsible for the current human tragedy that is unfolding. Of course this raises the question as to whether the Vatican, which is quite adept at politics, to use the current conflicts to expand its role and convert more indigenous Middle Eastern Christians as has been done in the past. We should note that the majority even currently, of the Middle East’s Christians are Eastern and Non-Chalcedonian Orthodox Christians and Assyrians, whose numbers have been reduced dramatically due to the imposition of Islamism, Zionism and the plethora of Roman Catholic and Protestant missionaries who keep descending upon the region in every generation bent on conversion and taking over the native churches. We are well aware of the current attempts by the Vatican to “bait” and “finance” the Assyrian Church to try and bring them into the Roman Catholic communion now that the Assyrian Church is church in peril and suffering under the current strife created by the Western backed jihadists. Many have questioned as to why this senior Orthodox figure has not been a more vocal advocate to garner support from other Orthodox Patriarchates and nations to provide the necessary support for the region’s native Christians, but is more concerned about continuing a dialogue with the Vatican that leads nowhere but possible submission to papal jurisdiction, and photo opportunities in Bethlehem… Of course some even asked as to why the current Ecumenical Patriarch who was more concerned about such photo opportunities did not make the effort to visit Taybeh which is the Holy Land’s last Christian enclave which has an overwhelmingly Orthodox Christian majority, but was visited instead by Pope Francis who ironically is a Pro-Zionist? Again why did Francis visit this predominately Orthodox Christian community that has a mere token Catholic minority? But then again, why is Pope Francis drawing up a peace plan for a region that has a predominately Orthodox Christian majority within its Christian presence? Is it not Orthodox Christians who are the predominate victims, is it not Orthodox churches which are being destroyed, is it not Orthodox cemeteries that are being desecrated and so forth???? Surely it is the responsibility of Orthodox Christian leaders that should put forward a peace plan and be supported and financed by Roman Catholic and Protestant Christians as a sign of solidarity and true ecumenism without the demonic ulterior motives of proselytism and the current guise of the ecumenical movement??!! Would not this do more to help build the first bridges towards Pan-Christian reconciliation and dialogue than the current efforts??? Yet what is actually occurring is best illustrated by the Vatican’s effort to purchase Orthodox churches that have been confiscated by the Turkish government and utilising those same churches which have been illegally, immorally and forcefully taken from their rightful owner, as new Roman Catholic and “Eastern rite Catholic” (Uniate) parishes and missions. The Eastern and Non Chalcedonian Orthodox and the Assyrians have not forgotten how Rome splintered the Maronites of Lebanon, the Melkites (“Greek Catholics”), the Chaldeans, the Coptic Catholics, the Assyrian Catholics, the Armenian Catholics, Ukrainian Catholics and many other groups from their original Orthodox Christian communions. Naturally these groups have been established because of the promise of financial, human and material support in return for their submission. And not surprisingly, the most vocal of Middle Eastern Christian leaders who are heard within the Western and global mass-media are invariably these Uniate traitors. 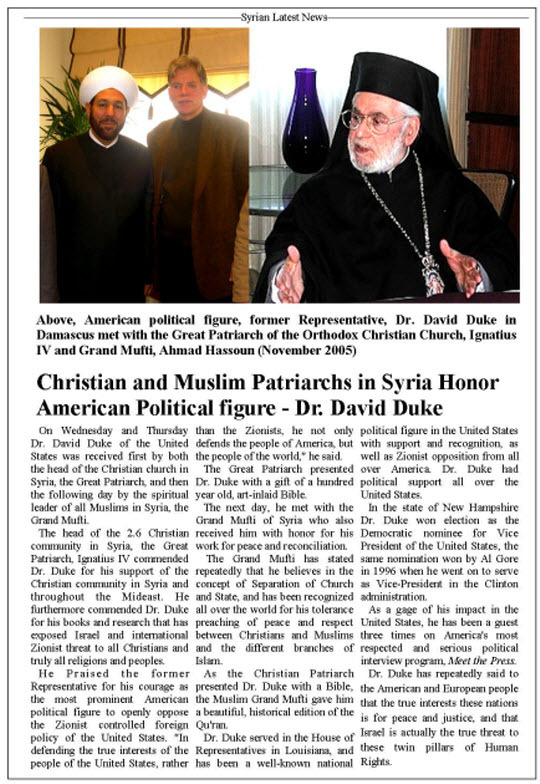 Very rarely will you see or hear any Patriarch of either the Eastern Orthodox Non-Chalcedonian Orthodox or Assyrian Churches, is this just coincidence….I think not! In any case many more things can be said, but it is best left for another article to discuss and for people to discuss and mull over and hopefully research and not take our assessment research and experience at face value.